Heat 1 tbsp olive oil in large heavy-bottomed saucepan and add onion. Cook over medium heat until soft but not browned, about 5 minutes. Add garlic and cook for 1 minute longer. Add tomatoes, chili sauce, jalapenos and oregano. Cook, uncovered over medium heat for 15 minutes or until sauce begins to thicken. Season to taste with salt and pepper. Stack tortillas and wrap in aluminum foil. Place in oven for 10 minutes. Keep wrapped until ready for use. Heat a large skillet on medium to low heat and add 1 tbsp olive oil. Crack the eggs into the pan. If the oil starts to spit, the heat is too high and should be turned down. Cook until the tops of the whites are set and the yolk is still runny. Using a spatula, remove eggs to a paper towel to soak up any excess oil. 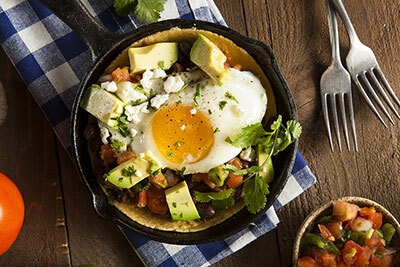 Place a warm tortilla on each of six plates; add a generous helping of Salsa Rancheros. Top with egg. Garnish with avocado chunks, cilantro leaves and Cotija cheese crumbles.